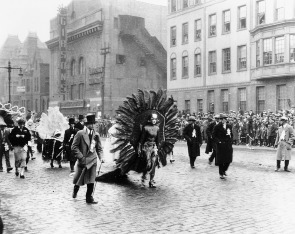 A Mummer from the Fancy Division marches down Broad Street. 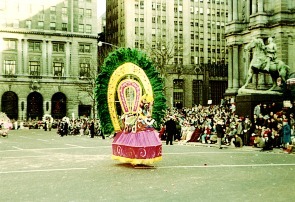 A Mummer from the Fancy Division on Broad Street. 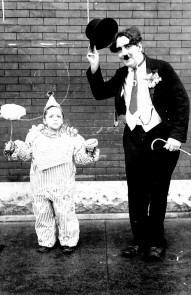 Two Mummers from the Comics division pose for a photograph. 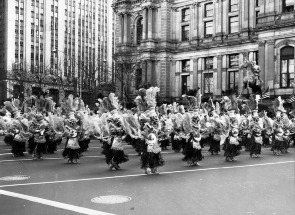 The Mummers Museum opened in 1976, and is dedicated to the annual Mummers parade, a unique tradition that dates to various celebrations held in 1800's Philadelphia. The museum houses a rich collection of mummers' paraphernalia and memorabilia, including vibrant costumes, a few of which date back to the turn of the 20th Century. In the basement, a banquet hall houses the Mummers Hall of Fame and a space that is frequently rented out for various groups such as local pre-schools and bar mitzvahs. The museum conducts tours and programs for both children and adults, and during the summer months, the museum offers free public string band concerts.